A shock for the international movement against lifestyle prohibition: Gian Turci, probably the most leading of its leading figures, died last month at the age of 58, after a severe brain hemorrhage. Gian was Director of the International Coalition against Prohibition (TICAP), President of Forces Italy, International Coordinator of Freedom2Choose (UK) and CEO of Forces International. Especially in the latter office he grew to be the powerful voice, the sharp intellect and the organizational nerve center of the global fight against the discrimination of lifestyles and health fascism. After obtaining a degree as an engineer in Italy, he moved to Canada where he spent 15 years of his life. Gian witnessed with dismay the creeping trend of this formerly free country towards nannyism. When someday the henchmen of „Public Health“ demanded him to stop smoking in front of his children, he began to fight back. The successful entrepreneur in the field of alternative fuels had been dedicating himself completely to the war – and he always knew it is not just a discussion – against prohibition since 1997. He founded FORCES Canada and, after his return to Italy (along with his wife and kids), also FORCES Italy. Earning only the minimum money needed in his new job as an interpreter, he uninterruptedly coordinated the activities from Genoa. “I consider myself a person in exile – in many ways”, he once said in an interview. From morning till night, he initiated and spearheaded numerous projects, he wrote, edited, translated countless articles and other texts, he communicated, conferred and this way became the most reliable resource of this movement. He did not spare himself and worked more than one can expect from anybody over such a long period. Gian sacrificed himself to the liberty he held dear. FORCES International, the flagship of our movement, owes its clear-cut and uncompromising profile to a large extent to him. Due to his straightforwardness, he was controversial with some activists. But being a founder and officer of TICAP in the last months of his life, Gian gained the well-deserved and undisputed recognition as a father and a leader of our movement. The convinced libertarian, who also translated works of the classic liberal thinker Bruno Leoni into English, never limited himself to the issue of tobacco. He always saw the big picture of the crusades against the smoking, the eating, the drinking and the underlying structures. Besides all that, Gian became a true friend to many of his fellow fighters. It was a pleasure to work with him, a warmhearted and humorous human being. His legacy is a collection of texts and videos, a group of well-working organizations, and a spirit that lives on in many of us. We can learn from Gian Turci that we must make sacrifices for our beloved freedom. That we have to fight the scientific and institutional corruption and not just its symptoms. That we need discipline, coordination and resources. That starts with a donation to FORCES International in his honor. Our sincere sympathy goes to his widow Anne and his two children. This text is an abbreviated version of the obituary written by TICAP Director Christoph Lövenich on March 12 (in German). Today, a legend celebrates his 90th birthday. We warmly congratulate. Former German Chancellor (1974-1982) Helmut Schmidt, the most popular politician in recent German history , is also a role model for s mokers. Well-known for his more than 70 years of heavy smoking (up to four packs of menthol cigarettes a day, accompanied by snuff), he constantly ignores smoking bans. "I smoke everywhere, except in a church" is one of his quotes. When the cool and rational Schmidt was asked whether you need passion for your work, he replied: "You need willpower. And cigarettes." He also smokes when being interviewed. And as his star as a TV personality has risen again the past years, you can watch him regularly on German TV smoking throughout the interviews, regardless of whether smoking bans are in place. There are so many places with smoking bans in this republic. Do you really think I care? Although his hearing abilities have suffered from his age, his intellect remains sharp and he has been having a comeback as a political analyst and historic witness adored by many. He also smokes on American TV, as you can watch here. His 89 year-old wife Loki Schmidt is an equally passionate smoker (in fact, she has been smoking even longer, since she was 10). A year ago, he and his wife were sued by a fanatical anti-smoker for flouting a smoking ban somewhere. They just had a laugh. Interviewer: Didn't adults at that time [in the Thirties] have any sense for the dangers of smoking? Schmidt: No, this hysteria didn't exist yet. Interviewer: Would you advise young people today not to start smoking? Interviewer: Have you never tried to quit smoking altogether? Interviewer: Cynics argue that smokers are beneficial for common welfare: They pay billions of tobacco taxes and die earlier. We wish him, the concentrate of virtue , and his wife all the best. Typical myths of the anti-smoking movement are the alleged dangers to hospitality staff by passive smoking and the claim by an Italian “scientist” that tobacco smoke leads to more toxins in the air than fumes from diesel engines. This propaganda was given a reality check by the German Berufsgenossenschaft Nahrungsmittel und Gaststätten (BGN), the Employer's Liability Insurance Association for the Food and Hospitality Sector, a compulsory body for all companies in that area, controlled by trade unions and employers’ organizations alike. Last year, their scientific and prevention department took a closer look at the fin dings of tobacco control researcher Giovanni Invernizzi (and colleagues) saying that ETS causes more particulate matter than an ecodiesel engine running idle. This study has already been exposed by FORCES International in a thorough theoretical analysis a few years ago. The German scientists of the BGN did something else: they reproduced the experiment under equal circumstances. But they used various different measurement instruments. Their conclusion: With suitable instruments, the pollution by an idling diesel engine is much greater than the one by cigarettes. There is only one instrument that leads to another result: the one Invernizzi used, an Aerosol Monitor unable to detect a large part of the ultrafine particulate matter from the car. The BGN analysis is now available in English (3 pages). If reality does not support epidemiologist charlatanry, then reality must be wrong. In more general terms, the scientists critized the literature on passive smoking and lung cancer. unprecedented in other fields of epidemiology. The consequences of the usage of incomparable methods in the individual studies are not scientifically nor socially defensible. be better than the bases upon which they rely. This analysis (7 pages) is also available in English. The BGN also questions the invented figure of 3.301 annual deaths by passive smoking in Germany, the antis’ propaganda myth no. 1. In a scientific conference, Prof. Ulrich Keil, Big Pharma friend, tobacco control alchemist, and the inventor of these non-existing deaths, was faced with critical questions by the head of the BGN Prevention department, Prof. Dr. Romano Grieshaber. Keil reacted typically: He immediately fled from the conference room. Speaking the truth makes you unpopular with anti-tobacco, so Prof. Grieshaber became the target of the usual witch-hunt. Behind the scenes, people like Keil tried to remove him from his office at the BGN, the WHO Collaborating Centre on Tobacco Controll in Germany attacked him, using the “well-known defense mechanisms like defamation, emotionalization, and the allegation of dependences” (official BGN paper). We hope that the voices of scientific decency will not be silenced. Bavaria – Munich, the Alps, lots of beer, the alleged “toughest” smoking ban in Germany and a strong resistance against it, as we reported. Thousands of tolerance clubs where you can legally smoke, some demonstrations, and increasing discontent with Nannyist government among the Bavarian people. That set the context of the state elections on September 28. All three parties represented in the state parliament so far (Christian-Social union - CSU, Social Democrats, Greens) had voted for the smoking ban. But the main blame is to be put on the dominant force, the CSU, which has been endowed by the voters with an absolute majority since 1962 and won a whopping 61 % at the last elections in 2003. Formerly THE people’s party in Bavaria and a symbol of the Free State of Bavaria like pretzels or the Hofbräuhaus, the arrogance of power seduced them into health dictatorship. The politically calm and to some extent even said to be apathetic Bavarians usually don’t get angry at their CSU leaders. But too much is too much. Smoking bans in their local Wirtshaus and next year in beer tents as well? Maybe even legislation on their beloved alcohol and food? It had become high time to give those that had lost touch with their constituents a slap on the face. And what a slap, right in the face of the antis! The CSU lost 17,3 % of their votes, not just their worst result since 1954, but also the heav iest loss of a party in any German state election since 1950. Ending up with just 43,4 %, they lost their absolute majority and need a coalition partner now. The Social Democrats, also proponents of the smoking ban, booked their worst result ever in post-war Bavaria, and the Green Party, the most fervent supporters of smoking bans, could not reach their electoral goals either. Winners of the elections were the Free Democrats who had loudly opposed the smoking ban during the campaign, and the Free Voters who alsohad critized this measure. Both parties received about 10 % of the votes each. Certainly, the smoking issue was not the only reason for the historic defeat of the CSU in Bavaria. But is was a crucial one, and for many voters, it symbolized a broader picture of arrogance and state intervention into the privates lives of the citizens, and of policital changes to the worse. Some rascals are thrown out, and the CSU, pressurized by the Free Democrats as the likely coalition partner, will have to revise the smoking ban. Smokers have shown their electoral power and relevance, they have raised their middle finger in a way that actually hurt the politicians. Well done! P.S. : Forces Germany, as well as other groups and initiatives, had put a lot of effort into mobilizing and educating the Bavarian voters during the campaign. We launched and promoted a special website, and spread more than one hundred thousand printed copies of “Neues vom Schelm”, a periodic publication with issues about the passive smoking fraud and the damages done by smoking bans. On January 1st, the “toughest” smoking ban for the hospitality sector in Germany came into effect. The Bavarian one. Separate smoking sections are not allowed, in all bars, restaurants, discotheques and beer tents, the fascist “solution” we know from the British Islands seems to prevail. Quite a change for the typical Bavarian “Wirtshaus”, the traditional place to drink huge steins of beer, to eat “Schweins haxn”, to play cards and to have a smoke. Next year, beer tents, including the huge ones at the Oktober, are to follow that road to Nannyist perdition. In an unprecedented effort to ‘re-educate’ their citizens, the dominating party, the Christian-Social Union (CSU), once led by the internationally (in)famous Franz-Josef Strauß, imposed this ban on the Bavarians. But how “tough” a ban is it at second glance? Well, the law applies to hospitality venues “as far as they are publicly accessible”. When and if only a restricted group of people may enter a room, the owner can is allowed to decide about smoking. This restricted group can be the members of a club or, for instance, the invitees of a wedding party. Many landlords and –ladies reacted immediately or after a few weeks or months: thousands of Smokers’ Clubs have been founded all over Bavaria, many of them part of the “Association for the Preservation of the Bavarian Hospitality Culture” (VEBWK), which alone has about 80,000 customers as their members. This organization used their strength in numbers for forceful political lobbying. Many clubs only cover one bar, restaurant or discotheque so that many people who want to go out have multiple memberships of smoker’s clubs. But we should call them ‘tolera nce clubs’ instead because smokers and non-smokers alike go there and enjoy freedom. In fact, some people even complain about their purses stuffed with so many membership cards. Others are proud of that (see picture). A mayor of a Bavarian town mentioned that his teenage daughter (a non-smokers) carries at least a handful of these membership cards with her when she goes out with her friends. The density of tolerance clubs varies from town to town and from region to region. In the Bavarian capital, Munich, an estimated one third of all locales are clubs of that kind. Access for tourists, e.g. readers of this blog, might be a more difficult issue. Some clubs require membership applications prior to entering the venue, others allow instant admission by signing a form at the entrance. The annual fee of the state-wide VEBWK is 12 Euros, smaller clubs often offer free membership. 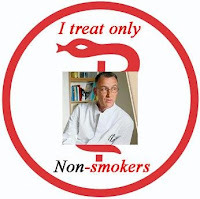 Not surprisingly to those familiar with increasing fanaticism of the nanny state, also in Germany there are first attempts of denying smokers equal access to medical treatment. Dr. Jochen Mathews, surgeon at the Heidekreis hospital in Soltau (Lower Saxony) called a patient one day before her long scheduled operation on her cruciate ligament to tell her that she has to take a tobacco withdrawal course first. If ‘successful’ she would be entitled to the operation. Asked by a journalist, the physician replied that he never operates smokers, only in acute cases of emergency. Others h ospitals reacted bewilderedly, some had never heard of such an incident, smokers are generally treated the same way as non-smokers. The Heidekreis hospital tried to defend itself against the outrage created by its employee. The director claimed that the patient's alleged bronchitis would require a three-week postponement of the operation. Interestingly, the woman was operated a few days later in another hospital. Apparently, some medical doctors don’t take the Hippocratic Oath but the Hypocritical one. Many owners und regulars of small German bars will remember the 30th of July, 2008, as the day when the ashtrays came back. The decision of the German Constitutional Court brought some freedom of choice to many venues, de jure in Berlin and Baden-Württemberg, de facto also in most other states. Although Germany is far from being in a post-ban situation, life has become easier for many. Whatever the states may decide in the coming months, social life and business figures can recover after the losses they faced. And the discussion about smoking, smoking bans and the nanny state in general remains on the agenda. The stakes are higher now, the antis push for total bans, but the number sceptical voices in the media and in politics increases as well. (a) The states now have until the end of 2009 to re-write their laws, and until then, smoking is allowed. (b) The rights of bar owners and the fact that smoking bans hurt business, have been officially recognised. (c) It demonstrates that action can make a difference. (d) We have another year and a half to fight the antismoking fascists. Forces Germany will of course take that challenge.